"What are your plans after internship?" seems to be the question everyone's asking me at the moment. I guess I have to address it in time to come anyway so I'll just say it all here? Well, the truth is... I have no idea. I do have an idea of how I want to celebrate my freedom but in terms of a career, nothing much. I am certain that most people have come across this point of time in their life where they just don't know which path to take and that's exactly where I am now. Being 20 is that age where you'd just feel lost and it's so ironic because it's supposedly the age where you're expected to become wiser and more mature. Kudos to those of you who've already found a job in whatever industry you're in and a pat on the back for those who've decided to further your studies. I have never seen myself such situations because I honestly hate studying and I only do it because I have to. I know the importance of it and I understand that having a qualification is vital for survival in our harsh world. Maybe I might go back to school again but I'll probably only do that because 1. I have nothing else to do. 2. I just need that degree cert. 3. That degree cert will enable me to get a better paying job. You see, I don't want to do it for the sake of it. But that's reality. That's the life our ancestors have path out for us.. we go to school, get a job, even if we hate the job, we stay in it to survive. I don't know what your idea of a comfortable future is, but for sure, mine isn't working under someone. I want to be a boss of my own company, what company might that be? Well, I haven't thought about it yet. But for sure, like what Sophia Amoruso (Founder and CEO of Nasty Gal) said, "anyone of you can be a #GIRLBOSS..." I want to live the rest of my life owning something. It gives me a bigger sense of accomplishment knowing that I actually did something I wanted to instead of taking the path most traveled. I'm not saying that it's bad to work under someone but based on what I've been through before and how my personality and character is like, I rather work for myself. Well, it's still too early to say and we never know what the future might bring, and my opinions may change over time as well, so we'll just see how it goes. Till I find something I am passionate about, I'm just going to enjoy my life while I can. Here's how I plan to celebrate my freedom once internship is over. I've always been juggling my time between school, blogging, events, photo shoots, family, friends, boyfriend and golden-once-in-a-lifetime-opportunities, and I just want to take at least a year to do all that again without the "school" part. Without that in my life, I can finally slot in two new categories, "travel" and "me-time"! hehehe! Yes, I plan to travel quite a bit if time allows me to and if Fai is able to take off from work as well. Apart from that, I might also be getting a puppy soon! Well, not any time soon, probably mid or late next year? I can't wait for it and I'm going to strive to be the best owner of all times! I know that having a puppy requires a lot of time and attention, and I want my puppy to grow up into a beautiful champion dog anyway, so during that period of time, all I'm going to do is stay home and blog so that I can be next to my little one while working. "Established in 2007 by Clare and Magdalene, Her Velvet Vase is all about bringing on an edgy, modern and classic take on tailored femininity. We hope to fill every girl's dream wardrobe with apparel from Her Velvet Vase so that with us, it's always easy to express yourself and your personal statement!" 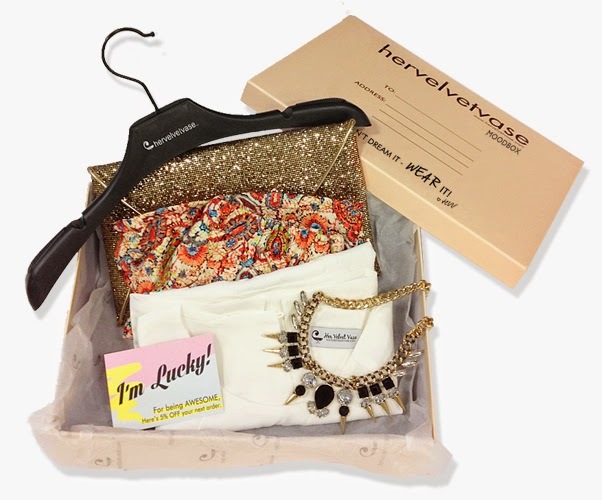 Just one look HerVelvetVase site and you know that they're definitely one of the leading online female fashion stores in Singapore. They're so impressive and every apparel on their site just looks so good! If you find it tough to pick out what you want, let HVV Mood Box do the work for you! 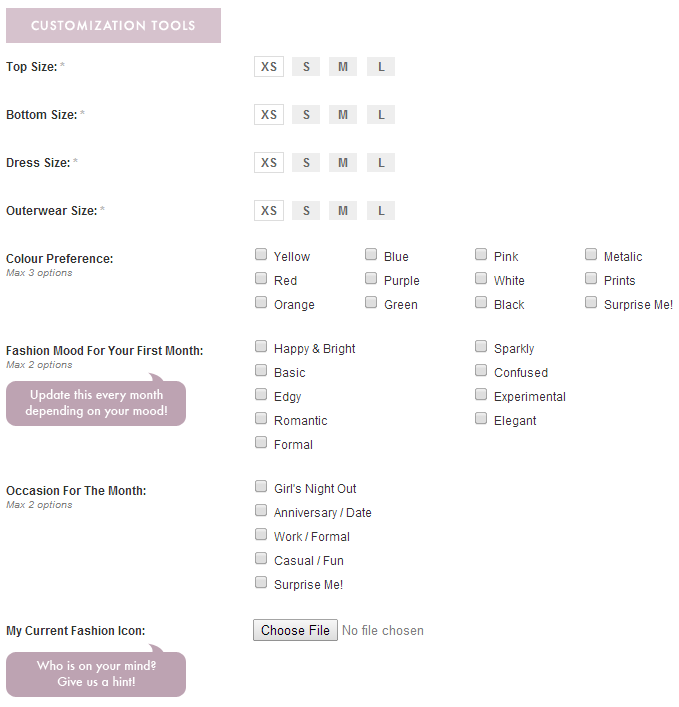 :) The HVV Mood Box consist of an outfit put together based on your preference selection style survey. All you have to do is simply head over to their website at http://hervelvetvase.com/mood-box and place your order by answering the necessary questions about...well, your mood for the month! Once that is done, just sit back and relax while they prepare a Mood Box specially curated just for you! I was thrilled when I opened the box to a little cross-body bag that I've been eyeing on for the longest time! The items that the HVV team picked out for me was spot on, I mean they're all items that I would definitely wear! And not only did they just send me apparels, it was such a pleasant surprise to receive other products as well, such as Liese hair dyes, Benefit sample Mascara, etc. Overall, I am just super impressed :) I think that this idea of a Mood Box would be great for a birthday gift for a friend if you're a little lost at what to buy. My favourite item from the Mood Box would have to be this stunning maxi dress! The length is perfect, the way the cut outs are positioned at are great as well, I have nothing bad to say about this dress at all. It's super comfy and it definitely fits into the "mood" and "occasion" I'd requested for on their preference selection style survey. Thank you HerVelvetVase for sending me over a Mood Box! I love surprises especially when it's receiving items that I genuinely adore. hehehe. So go on girls! Pamper and surprise yourself this month and order your very own Mood Box too. Or send a friend one on her birthday, I'm sure she'll love it! Like and follow HerVelvetVase on their social media platforms for more updates! Whether you're looking for classic, timeless and versatile pieces or really stunning and unique ones, Carrislabelle has them all! I'd picked out two very different apparels for this feature! One of which would be great for parties while the other is a little more sophisticated and it's great for events or more serious occasions. I'm sure you'll love them! I wore this gorgeous dress to Ashleigh's 21st birthday a few weeks back and I love it!! It's really comfy and since it's a skater dress, I don't have to worry about eating too much cakes and snacks at her party! hahaha. I didn't even need to accessorise much because the cobweb design on the neckline already looks stunning on it's own! One of my favourite dresses to date. Midi skirts are in whether you like it or not and here's a unique update to them! Add a panel of mesh! This whole mesh thing is a phenomenon and it's definitely a trend that I favour a lot. I love how this skirt works great for both work and play, it's just as comfy and the cobweb dress and it makes me look a lot more feminine and sophisticated! Besides that, enter discount code "EUNICE5" during checkout to get 5% off your cart! I couldn't agree more with your words. It's the sad truth that studies are more important that we think it is. And choosing what field we want to be involved in in the future is definitely taking a huge step. As for me, I'm doing my A Level in college now, and studying is fine for me. I mean, it's alright. As long as at the end I get to master and get hold of the subjects that I have difficulties with, I will be glad. It's an accomplishment. I can't deny that one of the reason pushing me forward to study hard and wanting to get into a university is because of the asian thought of my mine to be a successful and $$$-full person in the near future. Well, I guess this is the Asian fate.